Last night I actually dreamt I was doing a maths exam, and the final section had some mysterious word problems. Well, it turned out that today I ended up doing some practical maths problem solving. On Saturday I started my annual Christmas cake baking preparations by soaking the dried fruit. I normally go for a Rachel Allen recipe but since loving every single CCC recipe so far, I decided to try their one. I normally make one for us, one for my parents, one for Andy’s parents, and keep one as a birthday cake for Andy later on, so I normally double a recipe for a large one, and that makes 4 small ones. I didn’t compare each recipe and I think this one ended up being slightly more! Well soaking the fruits is the easy part, today came the hard part. This new recipe used grated carrot and apple, and this resulted in me spending about 20 minutes searching for the little stick thing that goes in the food processor under the grater instrument- and of course, it turned out to be in the correct case all the time, just hidden behind another blade. Grrrr! Creaming the butter and sugar was fine (I used my lovely Kitchenaid) but then grating in lemon and orange zest took ages! 4 oranges and 2 lemons. I found a big jug that would hold half the mixture. Then I had to work out what the fruit mixture weighed (1kg of fruit, plus 300g carrots, plus liquid, and how much do 4 apples weigh??) 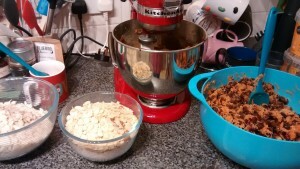 and put half of it into the kitchenaid bowl, along with one lot of flour. The other half of the ingredients were mixed in the big fruit soaking bowl. Oh my word it was getting stressful! I was worried the mixture would overflow when I turned it on, and I was running out of worktop space for all the bowls and jugs and spoons, and of course the cake tins! 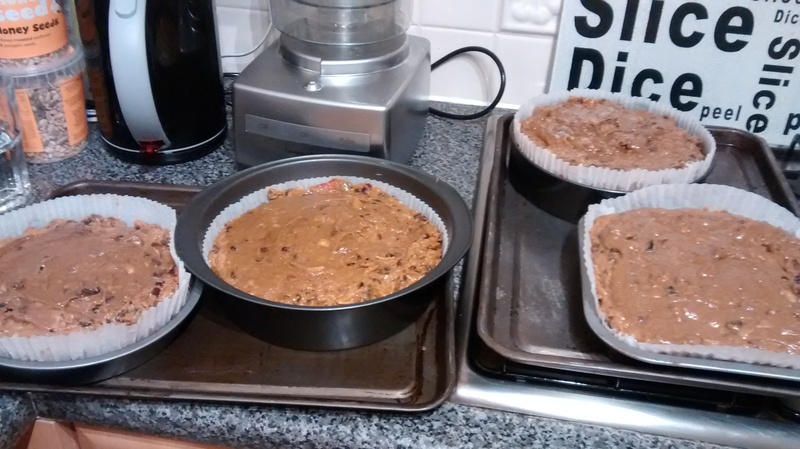 Somehow I managed to put the cake tins onto the big trays, but then when I went to put them on the shelves one tray would not fit so I had to put them directly on the oven shelf. And then of course was the washing up mountain! I just hope that they end up OK after all that. And I think next year I either need an enormous bowl, or I will bake them in two batches instead. That sounds less stressful! Author Maria RunsPosted on November 4, 2015 Categories Recipes, Stuff I love! How strange, I spent ages searching for the grater attachment for my food processor the other day. The time I spent looking for it, I could have just grated it by hand. Spooky! I don’t think I could have done, as it was around 1kg of things, but it was still annoying! BLIMEY. This sounds complicated. You kind of made my head explode a little there. But worth it in the end I’m sure! If you could package one up and send it my way that’d be great 😉 hehe! 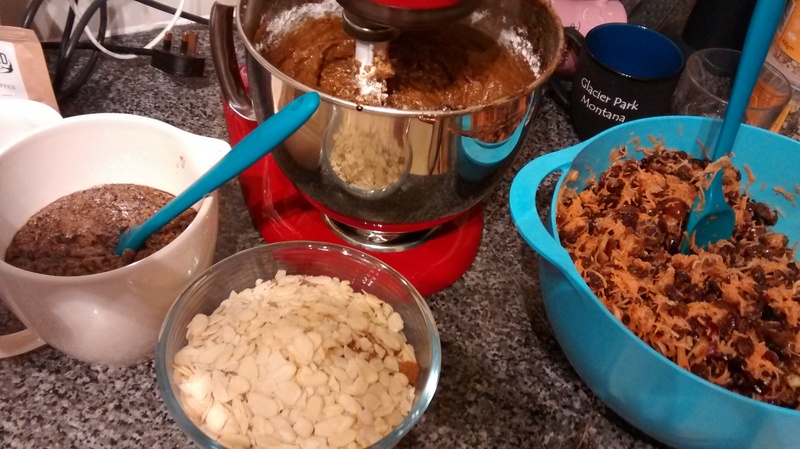 I shan’t be making a Christmas cake this year because…well, no one will eat it really as my parents don’t like it (my dad can’t eat dried fruit and my mum dislikes the icing and marzipan). I still see Ben’s mum and though she’s a fan (she has a recipe I always use) she still has loads in her freezer from last year. It’s a sad sorry state of affairs I tell you! I’ll just have to buy one of those mini ones just for me! Or buy a normal one for you, and freeze it for the rest of the year? Oh blimey! I hate getting caught out like that. I am very impressed that you make so many cakes. 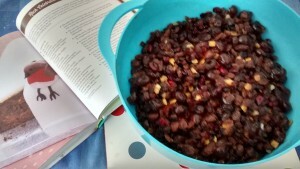 I would like to bake our own Christmas cake next year. It is one of my favourite things, although I look forward to the decorating more. I’m getting a proustian rush here: without actually being able to smell anything! I’ve never even considered making a Christmas cake before. I always find it funny that the dried fruit section in the baking aisle always looks a bit sparse at this time of year. This takes me back to October half terms when I was a child. My Mum always used to make two Christmas puddings, but the recipe she followed made three. 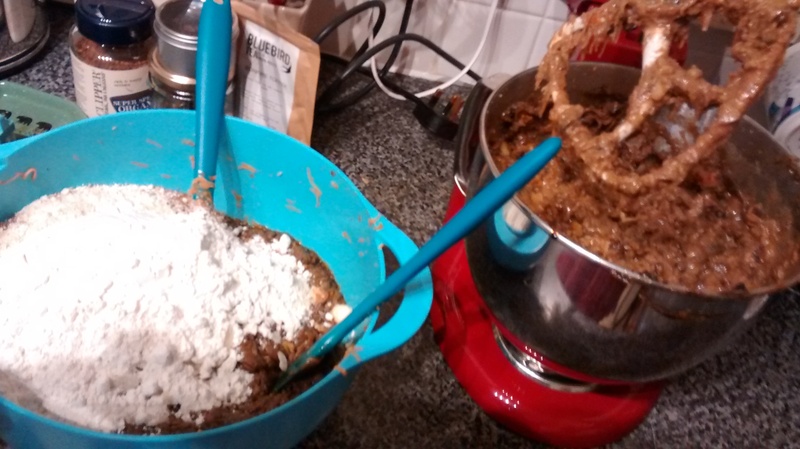 I’m not sure who ever had a bowl big enough to make three full-sized Christmas puddings in, as we had two overflowing ones just trying to make two thirds of the mixture, and we always forgot to cut down the amount of something! Nightmare! I feel your pain!